Organic is the new buzzword for food, but it can be a double-edged sword. On the plus side, organic is healthy, all-natural, good-for-you stuff, and if the food’s good it’s a win-win. But then there’s the downside that tends to come with environmentally-friendly, all-natural, non-processed foods, and what most of us care about the most: taste and price. Sure, the words are saying the right things, but those are just the hard facts. Sometimes with the growing trend towards eating healthier, we also find ourselves caught up in health extremes, like an “I just ate moss because it’s supposed to be good for you” type category. With that in mind, I decided to try a new type of organic, healthy food on campus and my first stop was McCracken Market. I didn’t have to go any further than that. 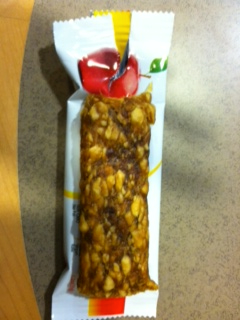 Of all organic food, I find granola bars are pretty interesting. They’re an easy snack that most people eat, and although more and more of them claim to be healthy, I still have my doubts. 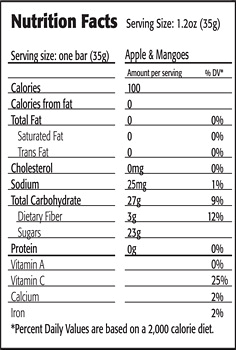 I’m pretty gullible and a sucker for good packaging, both of which make me any company’s ideal customer, but sometimes when I actually look at the label I’m surprised to find out that my “healthy purchase” wasn’t actually so good for me after all. 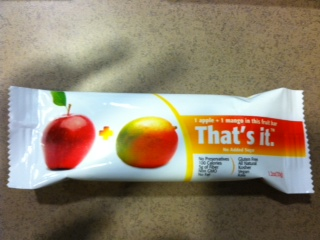 What caught my eye about “That’s it” granola bars was the byline: “1 apple + 1 mango in this fruit bar”. First of all, I appreciate the equation: simple but mathematical so it has some merit. My second thought was, what’s the catch? Underneath the label, it lists everything. So then my question again: what is in it? I immediately flipped to the back to look at the ingredients, just waiting to find that little print that lists added chemicals or something…but there’s nothing. Now for the important part: the taste. If you’ve ever had Trader Joe’s organic fruit strips, you’ll already know. That’s the best way I can think to describe a That’s It bar. It definitely has a texture to it and it’s kind of sticky but overall I’m a fan. It says Trader Joe’s all over it. But prepare to pay the price; literally. A 12-count box from the website will cost you $20 (without shipping added in). From Walmart, it ranges from $18-30. Whereas a 12-count Nature Valley box from the same Walmart will only be about $5. So do you get what you pay for? Well, with my invisible meal-plan one-swipe money, it can be hard to budget sometimes. But let’s just say if I actually went to Walmart with cash in my pocket, would I buy it then? In that case, I might just stick with an apple.